Blow up your tv. Get out there and do something. A couple hours effort result in a loin cloth for a GI Joe doll. Wear it with pride, little soldier. 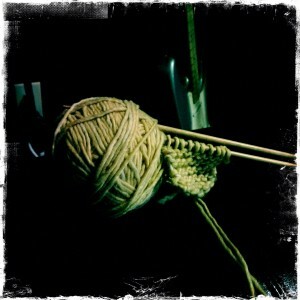 Seems like a basic survival skill – knitting. When the zombie apocalypse comes we’ll all need to make our own clothing and will probably also need something to do with our hands while we’re holed up in the dark, awaiting the inevitable destruction of humanity. I make no claims to having learned much about knitting in the hour in which I hoisted needles and a ball of yarn and bent them to my artistic will, but I post the attached video as supporting evidence that I did indeed learn one stitch. I’ll no longer go through life thinking Knit and Purl are two soccer teams locked in an eternal string of ties and low-scoring games. A Man A Plan: Napalm!